January 11, 2017, Astoria, Queens, New York – Two of the year’s most acclaimed nonfiction films, Cameraperson and OJ: Made in America, took the top awards at the 10th Annual Cinema Eye Honors, held tonight at the Museum of the Moving Image in Astoria, Queens. Kirsten Johnson’s Cameraperson took home three awards, Outstanding Cinematography for Johnson, Outstanding Editing for Nels Bangerter and Outstanding Nonfiction Feature for Johnson and producer Marilyn Ness. OJ: Made in America received two awards: Outstanding Direction for Ezra Edelman and Outstanding Production for Edelman and Caroline Waterlow. Awards were also presented to a number of other films on the Academy of Motion Picture’s Documentary Feature Shortlist: Clay Tweel’s Gleason, which received the Audience Choice Prize, voted on by more than 13,000 members of the public, Ketih Maitland’s Tower, which was honored for Outstanding Graphic Design & Animation, and Nanfu Wang’s Hooligan Sparrow, which won Outstanding Debut Feature. Bill and Turner Ross’ Contemporary Color won the Cinema Eye Honor for Outstanding Achievement in Original Music Score, which recognized composers and music directors David Byrne, LeeAnn Rossi and Aaron Rosenblum. Netflix’s acclaimed series Making a Murder received the honor for Outstanding Nonfiction Filmmaking for Television. Aaron Schock received the Short Film Award for La Laguna and Estephan Wagner and Moritz Siebert received the Spotlight Award for Those Who Jump. 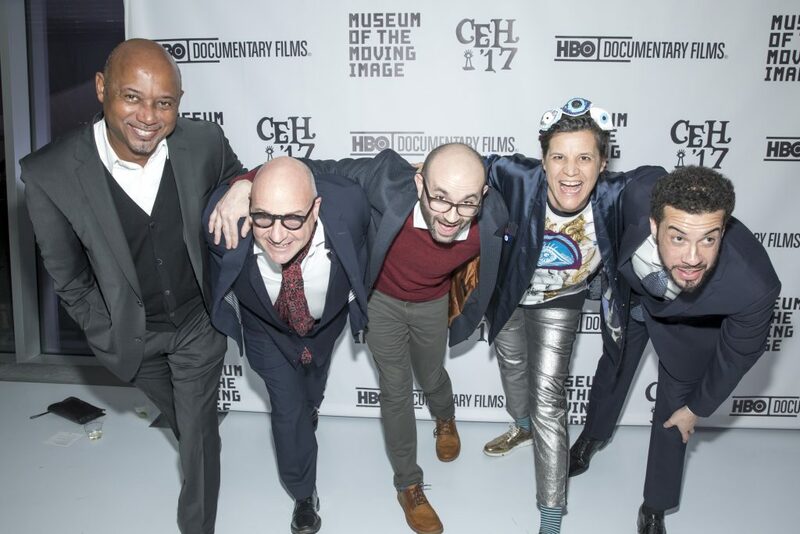 In a ceremony on Tuesday, Michal Marczak’s All These Sleepless Nights received the Heterodox Award for films that blur the line between fiction and nonfiction and Rob Epstein was presented the Legacy Award for his landmark classic, The Times of Harvey Milk. Award-winning filmmaker Steve James hosted the Cinema Eye Honors for the 2nd year in a row at the Museum of the Moving Image, which recently wrapped a 10-week retrospective of nonfiction films from the first decade of Cinema Eye. This year, Cinema Eye held a number of events that celebrated the past ten years of nonfiction filmmaking. On Tuesday in Manhattan, filmmakers Heidi Ewing and Rachel Grady, Alex Gibney, Steve James, Laura Poitras, Bill and Turner Ross and Frederick Wiseman were among those who gathered for a celebration of the nonfiction community and the work of the past decade. Cinema Eye was founded in 2007 as a protest of that year’s existing awards which had failed to recognize many of the year’s top artistic achievements. In the decade since, Cinema Eye has become one of the largest international gatherings of nonfiction filmmakers and craftspersons. Cinema Eye was the first organization to present an award for Production, Cinematography, Original Score and Graphic Design in Nonfiction Film, and the first, aside from the guilds, to recognize Direction and Editing. The Cinema Eye Honors for Nonfiction Filmmaking were founded in late 2007 to recognize and honor exemplary craft and innovation in nonfiction film. Cinema Eye’s mission is and has been to advocate for, recognize and promote the highest commitment to rigor and artistry in the nonfiction field. The Premiere Sponsor for the Cinema Eye Honors is HBO Documentary Films. Netflix, A&E IndieFilms, Camden International Film Festival, Field of Vision and Just Films/Ford Foundation are Major Sponsors. The Institutional Sponsor for #CEH17 is The Murray Center for Documentary Journalism at the University of Missouri. The Museum of the Moving Image is the Venue Partner. Industry Sponsors include ESPN Films, CPH:DOX, and Alamo Drafthouse. Contribruting Sponsors include American Cinema Editors, LEF Foundation, Sixty LES, Spacestation and the Whitney Museum for American Art. Cinema Eye is headed by a core team that includes Board Chairs Marshall Curry (director, Street Fight and Point and Shoot) and Charlotte Cook (Co-Creator and Executive Producer, Field of Vision), Cinema Eye Week Co-Chairs Wendy Garrett and Nathan Truesdell (director, Balloonfest and producer, We Always Lie to Strangers), Managing Director Will Lennon (producer, Speaking Is Difficult) and Founding Director AJ Schnack (director, Caucus and Kurt Cobain About A Son). Nominees for the Cinema Eye Honors short film awards were selected by a nominations committee that included Claire Aguilar (Sheffield Doc/Fest), Chris Boeckman (True/False), Cara Cusumano (Tribeca), Ben Fowlie (Camden International Film Festival), Claudette Godfrey (SXSW), Jasper Hokken (IDFA), Doug Jones (Images Cinema), Maggie Mackay (Vidiots), Ted Mott (Full Frame), Veton Nurkollari (DokuFest Kosovo), Dan Nuxoll (Rooftop Films), Mike Plante (Sundance), Shorts Chair Rachel Rosen (San Francisco), Shane Smith (Hot Docs) and Kim Yutani (Sundance). Nominees for the Television Award were selected in a two rounds of voting. The first round consisted of programmers that included Joanne Feinberg (formerly of Ashland), Tom Hall (Montclair), Sarah Harris (Dallas), Doug Jones (Images Cinema), Lane Kneedler (AFI FEST), Jim Kolmar (SXSW), Andrea Passafiume (formerly of AFI Docs), Andrew Rodgers (Denver) and Sadie Tillery (Full Frame). The second round included film critics and writers Paula Bernstein, Steve Dollar, Bilge Ebiri, Eric Hynes, Liz Shannon Miller, Mark Olsen, Jeff Reichert and Farihah Zaman. Finalists for the Heterodox Award were selected in voting by the Cinema Eye Honors Nominations Committee. The finalists were then viewed and five nominees were selected by a second round committee, composed of 8 nonfiction programmers and journalists, including Scott Macaulay (Editor in Chief, Filmmaker Magazine), Hadrian Belove (Executive Director, Cinefamily), Eric Hynes (Associate Curator of Film, Museum of the Moving Image), Doug Jones (Executive Director, Images Cinema), Mads Mikkelsen (Programmer, CPH:DOX), Dan Nuxoll (Program Director, Rooftop Films), Rachael Rakes (Film Critic, Brooklyn Rails) and Alison Willmore (Film Critic, Buzzfeed). The nominees for the Spotlight Award were selected in two rounds of voting by the Cinema Eye Honors Nominations Committee. The Spotlight Award Jury watched the six nominees and selected a winner. The jury was comprised of filmmakers Iyabo Boyd, Andrew Cohn, Brenda Coughlin, Johanna Hamilton and Sloane Klevin.